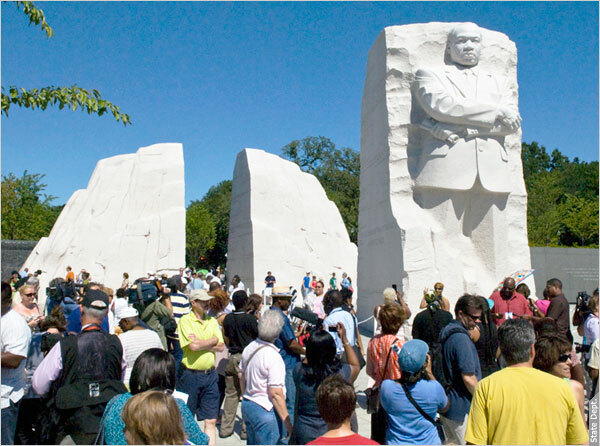 Memorial Honors Life of Martin Luther King Jr.
Martin Luther King Jr.’s dream has returned to Washington. The King Memorial is near the Abraham Lincoln Memorial, from the steps of which King delivered his famous “I Have a Dream” speech in the summer of 1963. At the time, African Americans in many places were segregated from whites in schools, shopping places and restaurants and on buses. Their attempts to register to vote in the South often were met with violence. King had begun a long campaign of nonviolent resistance to rectify these wrongs. In his “Dream” speech, King said his people would not be satisfied “until justice rolls down like waters and righteousness like a mighty stream.” Less than one year later, President Lyndon Johnson signed the Civil Rights Act, ending segregation practices. The opening of the memorial to the public begins a week of events in Washington, including concerts and symposiums, leading up to the dedication ceremony on August 28.